Another vanillabox sample, this time a fancy box. I wanted it to be different to all the other boxes I've made, I didn't want any visible finger joints and I wanted a fancy pattern on the sides. It's effectively a two skin box, the inner holds the finger joints and the out has the decorative panels, the lid overlaps the inner to make it stay in place. The inside of the hex pattern was engraved to make it appear to be cut from a different material (although with the two skins it could actually have been cut on the inner layer). Low power lines complete the knot work appearance. 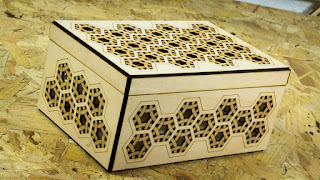 I'd be tempted to make it again as a hexagonal box so I'm going to hold the files back for the time being. Another vanillabox sample piece, this time I wanted to demonstrate what could be done with a little bit of imagination. The large block of oak was cut by hand and the pattern cut into the top surface. Each ring was made by putting multiple low power cuts next to each other, this left a gap that was large/deep enough to accept a strip of metal which was hammered into place. The whole thing was sanded, varnished and polished within an inch of its life. I was intending to write an instructable about how to do this but somebody else beat me to it so if you want to make your own inlays I would suggest you read this instead. While making samples for the vanillabox I was keen to experiment with new/cheap materials. 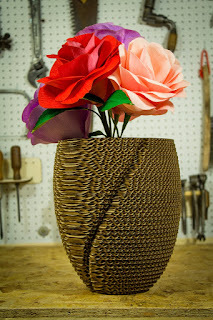 I modelled this vase in 3D and sliced it with 123D make (which now appears to have gone), I cut each layer in corrugated card. I actually started life as a lampshade but it didn't let enough light through so when it was flipped upside down I realised it would make a nice vase. The petals for the flowers were all cut from crepe paper using a very low power so as to minimise the burning around the edges. The petals were wrapped with floral tape and wire to create the flower shapes. At the maker faire we had to label the item because people didn't realise the flowers were laser cut.